The FATIMA workplan is structured in management activities (one WP) and thematic activities (six WP blocks), with the work packages presented below. 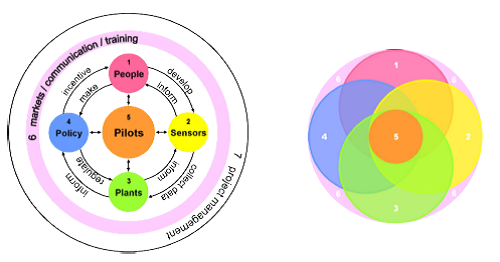 The Figure below illustrates the flow of demand (clockwise) and supply (anti-clockwise) that drive the pilots (WP-block 5 in the center) and the innovation, market preparation, and roadmap to sustainable implementation (WP-block 6 as the envelope). In the systemic view (right panel of Figure 1) all circles overlap (i.e., are interconnected), while the linearized view (left panel) allows for following the flow of individual WPs. Figure 1: WP-block interconnection flow diagram: linearized view (left) and systemic view (right). WP-block 1 (“People”) WP 1.1: User community requirements and multi-actor platform. Objective: To foster a strong collaborative multi-actor community (in and beyond the pilot areas) with a sense of co-ownership of and responsibility for FATIMA tools and to co-create the enabling environment for implementation, uptake, and sustainable financing. WP 1.2: Socio-economic analysis/Prosperous farming communities. Objective: To develop and implement a common analytical framework for the socio-economic assessment of innovative farming tools and agri-environmental capacities that help to optimize the management of external inputs (nutrients and water) and maximize the delivery of ecosystem services in agricultural landscapes. To design and develop a shared vision for prosperous farming communities in each pilot area making use of socioeconomic tools and methods and the multi-actor community platform. WP-block 2 (“Systems”) WP 2.1: webGIS integrating platform, WSN, and user interface Objective: To create the central information and communication hub of FATIMA, a webGIS-based Modeling and Decision-Support System (MDSS) and to assemble the FATIMA prototype, integrating data from EO, models, WSN and other in-field into web- or smartphone-accessible information and tools for nutrient and yield management, irrigation scheduling, and integrated/holistic precision farming. WP 2.2: Earth Observation (EO) for monitoring plant status and yield Objective: To consolidate and implement the FATIMA EO portfolio methodology and production line, including purpose-oriented quality control, merging data streams from a set of EO satellites, smart sensor networks, and other non-EO sources, and from a range of models (soil water balance, weather forecast and nowcast) in order to provide timely maps at subplot scale about the nutrient and water requirements of crops and of yield. WP 2.3: WSN for soil, plant, water, and yield monitoring Objective: To create on-site networks of information and MDSS “satellites”, based on multi-way coupling of ground-based smart sensor networks, precision farming machinery, and EO-derived products and tools. WP-block 3 (“Plant/soil” – on-farm input management) WP 3.1: Very-high-resolution variable rate (VRT) nitrogen management Objective: To implement real-time and variable-rate (VRT) application of granular fertilizers in order to reduce nitrogen (N) inputs, increase crop yields and the environmental performance of cropping systems. To demonstrate the sustainability of this management practice and the economic benefits for converting conventional N management to site-specific N management. WP 3.2: Upscaling VRT for nutrient and water efficiency and yield optimization Objective: To develop, test, and implement diagnosis and support tools for variable rate application of nutrients and water at commercial production plot scale and beyond. WP 3.3: Sustainable soil management practices and cropping systems Objective: To review existing cropping systems and soil management practices (like organic and conservation agriculture, crop rotation, no tillage) for their sustainability potential (using an indicator-based framework) and in particular, to review sustainable ways to reverse the process of soil organic matter (SOM) depletion and soil degradation by combining compost application with cover crop rotation. WP-block 4 (“Policies”) WP 4.1: Water-food-energy nexus Objective: To develop and implement a framework for energy-water-food assessment in pilot areas and integrate it into the central MDSS hub and the FATIMA prototypes. This includes energy audits of farm areas and energy footprints of rural areas. WP 4.2: Policy analysis and indicator framework Objective: To understand which policies and incentives are needed to enable the paradigm shift to a sustainable, resource efficient crop production system, i.e. to achieve optimized yield with minimum inputs, while preserving the environment and moving towards socially viable rural farming communities. To use this knowledge to identify opportunities for the formulation of improved policy instruments and innovative financial arrangements based on extended stakeholder involvement in the policy formulation process. WP-block 5 (“Pilots and strategic integration”) Objective: To demonstrate FATIMA tools at a range of scales by test-implementing and validating them during campaigns in eight pilot areas. This includes assembling farm-related EO data products into practical farm management application tools (including for precision farming) and regional scale agri environmental EO data products into policy-supporting indicator-, accounting-, and footprint-based frameworks. To weave together the outputs/outcomes of all WPs in a continuous process in order to ensure coherence between the different parallel strands leading towards sustainable crop production. WP-block 6 (“Market consolidation, dissemination, and training”) This WP is devoted to all activities that may increase the impact of our activities (dissemination, use for further research, exploitation, training, communication, and publicity). Objective: To monitor and report project progress and provide the communication platform and collaboration between the consortium members.